In 1854, after recently arriving from England, twenty-two-year-old Reuben Smith traveled west, eventually making his way to Kansas Territory. There he found himself in the midst of a bloody prelude to the Civil War, as Free Staters and defenders of slavery battled to stake their claim. The young Englishman wrote down what he witnessed in a diary where he had already begun documenting his days in a clear and candid fashion. As beautifully written as they are keenly observant, these diaries afford an unusual view of America in its most tumultuous times, of Kansas in its critical historical moments, and of one mans life in the middle of it all for fifty years. When did you first have the idea to work on The Diaries of Reuben Smith? My first introduction to Reuben Smith’s diaries happened forty years ago when I was a graduate assistant in the Special Collections Department of Wichita State University’s library. While I was organizing the manuscript collection of Kansas poet May Williams Ward, I found an excerpt from her grandfather’s diary describing his voyage from England to America in 1854. It was a fascinating story and once I started reading it, I couldn’t stop. Soon after, I learned from one of Ward’s cousins that their Grandfather Smith had written extensive diaries and they were believed to be in the possession of a descendant living in Texas. Now, fast-forward to 2009 when I was finishing my book Prairie Rhythms, a biographical book about May Williams Ward. I was checking some references at the Kansas Historical Society’s archives when I saw that the complete set of Reuben Smith’s diaries had been acquired and was available for viewing. Of course I had to see them. And I found the stories within them as captivating as the excerpt I’d read back in 1978. I knew then what my next project would be. Can you describe your process of writing? How long did you spend working on the book? When I first began, I honestly had no idea how I was going to present the diaries in the book. I didn’t want the book to be simply a transcription of the diaries; I wanted it to appeal to a general audience, ranging from those who would simply enjoy Smith’s personal stories to those who would appreciate the historical details contained in them. So, I guess you could say it was a bit like letting the fabric speak to the designer or the canvas dictate to the artist. It was a process that kept evolving, and I tried to let the diaries guide me. When I first read through them, I noted some of my own curiosities and what I felt I needed to learn in order to understand who some of the people were and the roles they played, especially during the Civil War years. Gradually, I began to picture my role as one to provide the background for Smith’s stories, offering the necessary information to make the stories more meaningful. After I finished typing the diaries into a word processing document, I launched into research, especially pertaining to Civil War military history, because I wanted to let readers know what was happening at various times, both nationally and regionally. An added bonus to this was learning so much about where I’d grown up and where my father’s family settled along the western border of Missouri. It truly became a journey for me as well as for the book. During this time, I also began to see that the diaries could be sectioned into categories, or chapters, and not necessarily by years. In addition, I began to see that not every diary entry needed to be included. The significant stories within the diaries are those that provide a new primary resource for early Kansas history. In all, I spent two and a half years working on the book, including the various editing stages involved in the publishing process. What was the most challenging aspect of editing the publication? I’m not sure I can assign “most challenging” to any one aspect, but initially, I had to figure out a workable way to transfer the original diaries to a word processing document. It was a tremendous help to be able to access the diaries through the Kansas Historical Society’s “Kansas Memory” website, but it took some experimenting to figure out a workable way to read from one screen while typing to another. It was a bit tricky working with a desktop computer and a Surface tablet at the same time, using two keyboards and two mouses, but the equipment and I eventually settled into a routine. Beyond logistics, an ongoing challenge was identifying references in the diaries to unfamiliar names and phrases — ranging from towns, creeks and bridges that no longer exist to the nickname of an insect that was notorious for residing in Missouri soldiers’ tents. I consulted all sorts of unusual and dated resources, even an 1860s military medical guide, to find answers. One of the local interlibrary loan librarians finally asked me, “What ARE you working on?” Some field trips were involved as well. But this historical “digging” was fun, and the little victories were rewarding. 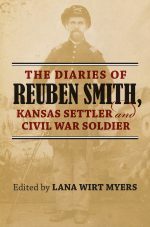 The Diaries of Reuben Smith is a beautiful narrative of Free State settler and Civil War soldier. Smith’s writing is moving and candid. What do you think readers, both from Kansas and across the globe, will find more interesting about his story? I think Smith provides an unusual perspective, being a young Englishman who formed his political opinions after arriving in the United States, unfiltered by familial or geographical loyalties. And he’s never a bystander; he’s a participant. He gives us personal introductions to key figures, and through his descriptions of what he observes and experiences, we feel as though we are there alongside him. He takes us with him as he encounters border ruffians, wolves and Indians on his way to stake a claim on land in Kansas Territory. And through his writings, we witness the escalation of the Civil War along the Kansas-Missouri border, as well as Smith’s evolution from a civilian volunteer soldier to a seasoned military officer. We can see the process. We can watch as history unfolds. Smith was an early steward of the Kansas State Insane Asylum. Is there any indication of how he would view the current state of the Larned State Hospital and Osawatomie State Hospital? I’ve thought about that as I’ve read news articles about the problems facing these institutions, especially Osawatomie State Hospital, since Smith was entrusted with its funds as steward during the early days of its operation. Smith experienced firsthand what the swinging pendulum of politics can do to the state’s institutions. I believe he’d be busy writing letters to newspapers, as well as to legislators, voicing his opinions and proposing solutions. If you could have any one person read your book, who would it be and why? I’m going to take the liberty of defining “one person” as all of Smith’s descendants. And that is no small number, since Smith fathered thirteen children, ten of whom lived to adulthood. I can’t imagine a more treasured gift for a father to leave his children and grandchildren than fifty years of his personal history, during which he participated in the settlement and statehood of Kansas, in the fight against slavery, in postwar politics, and in the operation of the state’s first psychiatric hospital. Smith wanted his children to read history as he lived it. And I’m anxious for his many grandchildren to meet him. Lana Wirt Myers is the author of Prairie Rhythms: The Life and Poetry of May Williams Ward, named a 2011 Kansas Notable Book.